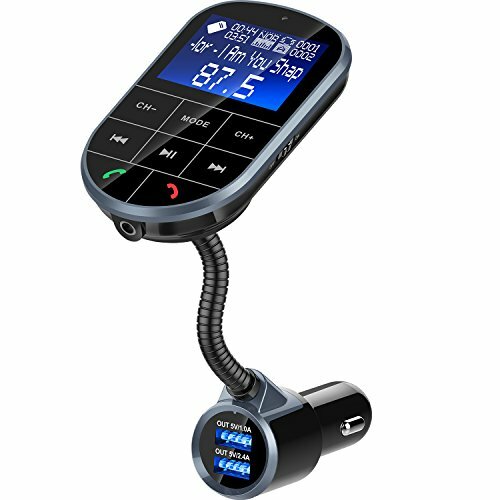 The device is wireless in-car bluetooth FM transmitter, equipped with hands-free calling, music playing, quick charge functions, makes your driving more safer, enjoyable and convenient. Start the car, the screen will display the car battery voltage. You can know your car battery state easily. Connect the mobile phone to the USB port, the internal charging recognition chip will shake hands with the device to obtain the maximum charging current under the premise of protecting the charging device. Features large functional buttons, easy to operate with one hand. When no need to use the FM function, pressing on/off button to turn off the FM functions, then the screen will be dark and keep charging function. The bluetooth V4.2 technology consumes less energy and lasts longer, and EDR(Enhanced Data Rate) ensures fast transmission and stable connection. Plug it into the car cigarette lighter and power on, turn on car radio and turn radio to any blank channel(ATTENTION: local channels are unavailable), then adjust the frequency of the radio transmitter and match it to the car radio, you can pair it with your phone for music. 1. The local channels are unavailable, please skip the frequency with strong signal in local to get a better sound quality. 2. The working voltage is 12-24 V, please make sure your car voltage is within the voltage range, otherwise it will affect the performance of the car plug in radio adapter.